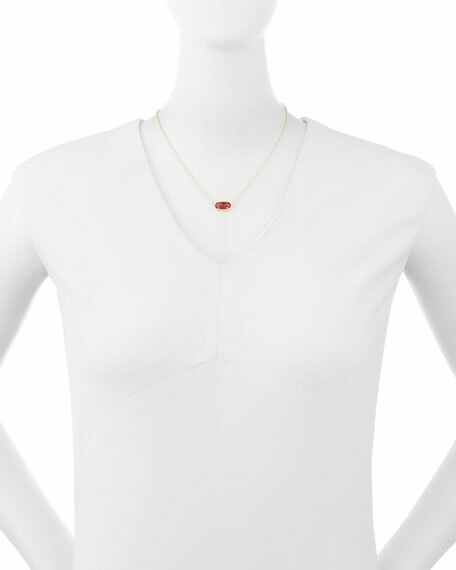 Kendra Scott "Elisa" necklace features a simulated birthstone-colored crystal pendant. 14-karat yellow gold-plated brass cable chain. Integrated east-west pendant in signature carved prong setting. Choose your pendant: faceted berry crystal (January); amethyst-colored crystal (February); light blue illusion crystal (March); faceted clear crystal (April); emerald-colored cat's eye crystal (May); ivory-tone mother-of-pearl (June); ruby-red dyed crystal (July); peridot-colored illusion crystal (August); cobalt cat's eye crystal (September); berry illusion crystal (October); orange citrine quartz (November); dyed London blue crystal (December). Approx. 15"L with 2" extender; pendant, 0.7"W.